Look at the guy. Just look at him. Has there ever been a more vulnerable, downcast, and yes, absolutely pathetic looking costumed do-gooder than the one standing center stage in this powerful splash page? I don't think so--and certainly not up that watershed point in the hallowed history of union-suited super-doers, I guarantee you! And for that very reason, we loved him all the more for it! 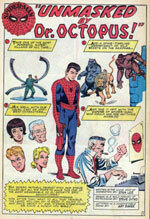 You may've read about that particular issues landmark adventure in my previous piece accompanying ASM #12's cover. (And if not--get thee to it, pilgrim!) It was quite the escapade. They ALL were, back then.(..sigh..) 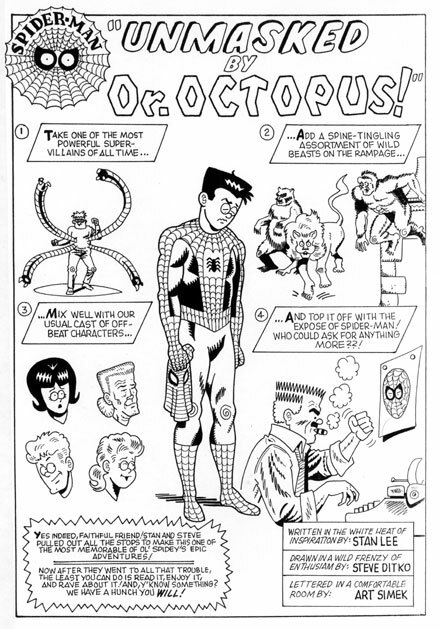 But Ditko's masterfully symbolic illustration certainly sets the proper tone for what was to be yet another boundaries-bursting Spider-Man episode--and THIS time, he does it by the numbers! Dr. Octopus! Lions, gorillas, and bears (Oh my!)! Aunt May, Flash Thompson, Liz Allan, and, debuting her brand-new hairstyle (bringing her look all the way up to, oh, I don't know--the early fifties, perhaps?... ), Betty Brant! And madly pounding out words of hate aimed towards the unappreciated adventurer, the cigar-chomping J. Jonah Jameson! Standing in the middle of it all, head hung 'neath a revealing (if ultimately misleading) Artie Simek inscribed title blurb is poor ol' Petey himself! Wow! Take one quick glance at THIS numerical chart, and then just try NOT to read the story herein!! I assure you, in back in 1964, it plainly could not be done!